Listening to a book is very different than reading it. Share what you think are the best books on tape and best audio books out there, and I'll tell you my opinions too. I still call them books on tape, even though I rarely check them out that way in the library anymore. I prefer CDs now, or digital downloads, but still the name has stuck. But whatever you call them, these audio books can be helpful, because you can listen while you drive, exercise, or clean your home for example. That is some of the ways I use audio books anyway. Once you listen to an audio book you will soon find out the talent of the person reading it, or lack thereof, will dramatically impact how much you enjoy the book. Basically, to have a great audio book you need both a well written book, and also need a talented narrator of the written word to make it come alive. Rarely should the authors themselves read their own books, because many of them while talented at writing stink at reading in a way that is not completely boring, incomprehensible or worse. 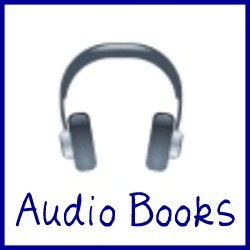 I will be sharing some of my suggestions for the best audio books here, over time. To start, even though I haven't written a whole review yet, I would suggest any of the Harry Potter books, read to you by Jim Dale . The man is quite talented, and keeps my whole family, including my husband and children, entertained on long car rides to see family, since he uses a different voice for each character and another for the narrated parts. Overall, quite superb. I obviously haven't listened to every book out there to know all the best books on tape, so I want your help by sharing the ones you really have enjoyed too. Also a helpful hint - a great resource for these audio books is your local library. That is where I borrow most of the ones I have listened to, so if you don't want to buy them yourself check out the selection they have that you can borrow for free. Have you listed to an audio book, podcast, mp3 download, book on tape or CD, or anything like that and thought it was really helpful or informative for you in your role as a home manager, and would recommend that others listen to it too? If so, share your audio book recommendation with us here and explain why you would recommend it.